I didn't get the job but for once I received some excellent feedback and an honest response when I asked "Did the job go internally?" Apparently I provided excellent answers but the internal candidates have the advantage of knowing what approaches are used particularly with regard to physical health. The use of many medications in psychiatry, particularly anti-psychotic medications can shorten ones life by 10 - 20 years. If psychiatrists stated from the start "This medication will possibly reduce some of the symptoms of psychosis but it is extremely likely to cause significant weight gain, dull your senses, cause impotence, contribute to heart problems and as a male you will grow large breasts. You are also highly likely to develop diabetes and die twenty years earlier than the average." It is unlikely to improve the uptake of that medication. It is only over the last few years that psychiatry has begun to address this, generally because others (patients) have pointed out how awful the side effects are of these medications. I discovered yesterday that the system used locally and it is a good system, is completely different from the systems used elsewhere in the NHS. The feedback I received yesterday has directed me to some excellent sites to explore and learn for when I attend another interview and I can then answer questions using these specific buzzwords. It's interesting that gaining a job depends on stating these specific buzzwords related to physical health and any past experience in non-pharmacological approaches is ignored or appears superfluous. I might have reservations about local mental health services but I now believe they have the right approach and other services are only now playing catch up. So yesterday I felt completely deflated and angry but today, c'est la vie! I learned something new and finally received an answer as to why my efforts to get a job with that particular health trust fell at the last hurdle. They have suggested I apply for a couple of jobs which will be advertised in the next few weeks. 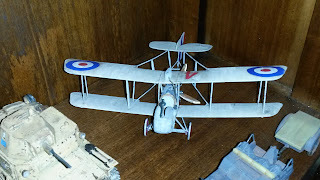 The finally completed DH2 biplane is in the cabinet and although I am not happy with it, I have completed a kit that I did not think I would finish. No rigging as I value my sanity and I can imagine the rigging is there. I am now at this stage for the KV 1c, a heavy Russian tank which gave the Germans a nasty shock in 1941 along with the T34 tank. I also bought some new brushes from the local thrift store as my paint brushes do get a battering. 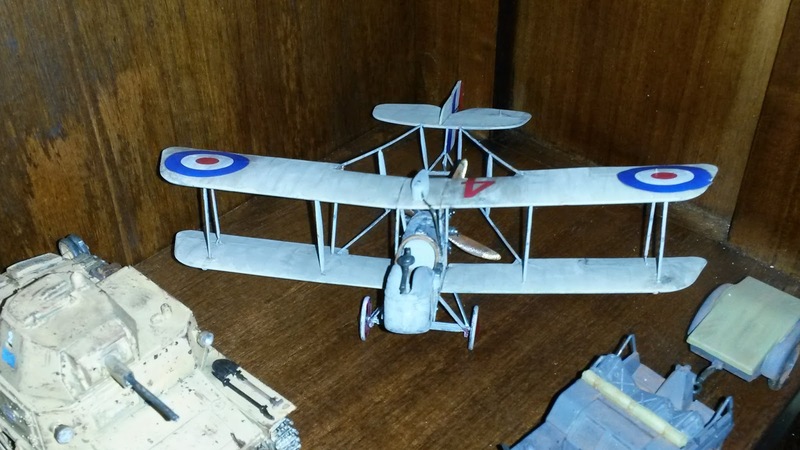 A nice easy armour kit after the nightmare of wings and spars, going together very well and no real problems encountered. Primer on and the tracks painted up but feline interventions put a stop to the work in progress as rain stopped any play outdoors. Maisie dislikes the temporary resident Fluffy and an almighty cat fight broke out beneath the desk. Fur and hisses everywhere so I had to intervene. Fluffy is with us until next Tuesday when he'll be taken to the vet for neutering and then rehoming. I'd love to keep him as he is a delightful and friendly little character but this is Maisie's home and she is a rescue cat, as are the others. I can't afford five cats especially as I am not currently employed but some home will be made complete and all the richer for his presence. His meow is decidedly odd as he sounds like the trill of a mobile phone! Sorry you didn't get the job. Doesn't it seem you could do anything you applied for if you could just get past the interview? Just me, probably. Sounds like they liked you, though, so maybe next time. And I'm happy you're taking care of Fluffy until he can be rehomed. Totally changed my professional as well as personal view/life. I'm sickened by the 'tick box' play-the-game interview format of today. I haven't read that BW. I know he studied with Laing so I will look that book up. Yes, tick box interviews are appalling. The identikit managers gives me cause for concern as they too tick their managerial boxes. I might have a look at working outside the NHS, try some of the other sectors such as social care but I begin to feel I no longer fit their neat little boxes.